Oh, wait for it, later today you will be getting some lovely pictures! Suddenly I have an (almost) working kitchen!! Come back in 8 hours or so …..
First, the garden. I have not been neglecting it, but doing the best I can while under the weather. Thank you so much to Damien who came round last week and helped dig out the remaining two beds of potatoes! Damien – you were amazing, thank you. The bean harvest is coming in, too. 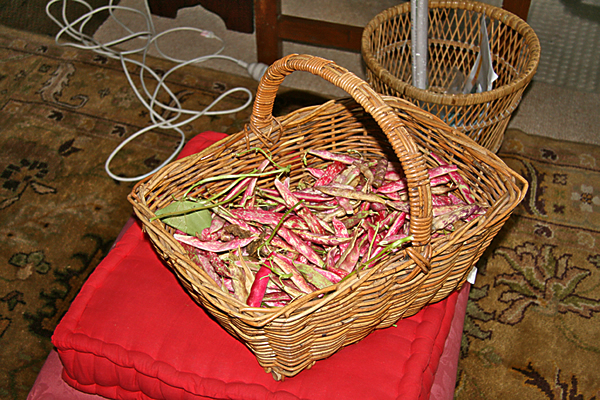 Picked borlotti beans the other day which have now dried out nicely in the greenhouse (the unexpected bonus of the greenhouse is that it is brilliant for drying the harvest). 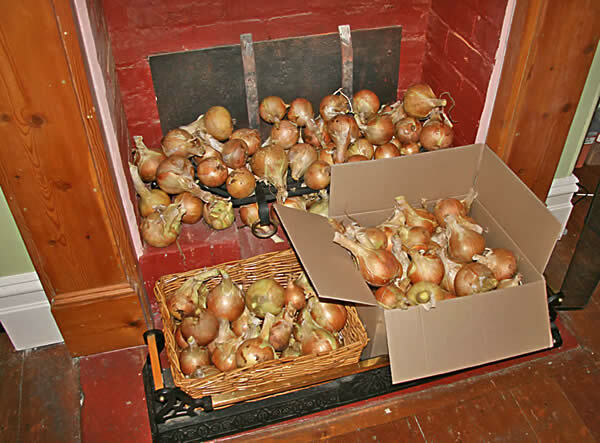 And what better place to store the amazing onion harvest but in a spare fireplace! Once I get the kitchen back I will slice many of these and put in the freezer. I have tried drying them in the past but it never seems to work well. The dehydrator is constantly going drying out tomatoes and zucchini. Now to the kitchen. Suddenly this past week it has all started to come together and I can finally see how it will eventually look. And it will look good. The final major job is the painting, also the sparky to actually connect up power (lights, power points, stove), then there are a million smaller jobs. But it is over the worst now. In the past week the cabinets were largely finished off (still need glass doors and shelves, door knobs etc and a few things fixed), the sink is in and plumbed, the Falcon cooker is in (! !I am so excited!!) and the gas hob plumbed in but the sparky still has to connect the electrics. Nonetheless I can cook on the hob, glory be. And I can wash up in the sink. Glory be. Tiles are mostly up but edging and finery needs to be finished. So yeah, there is still one good week’s work, and then dribs and dribbles over the few weeks after that (fire screen, hanging pot rack, minor adjustments), but I am past the worse. The mat is just to protect the floor from the tradies’ hob nailed boots, and the trash bins still need their drawer fronts, but you get the idea. The Falcon cooker all the way from London! I am in love, I kiss it! Many thanks to Karen Brooks for suggesting this. 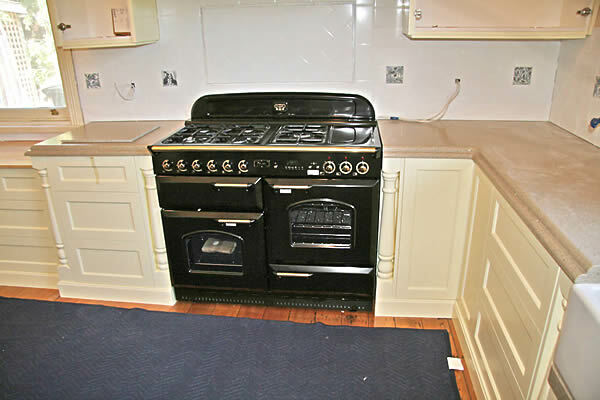 It is made by the Aga company, and has the ambiance of an Aga, but all the modern cons. 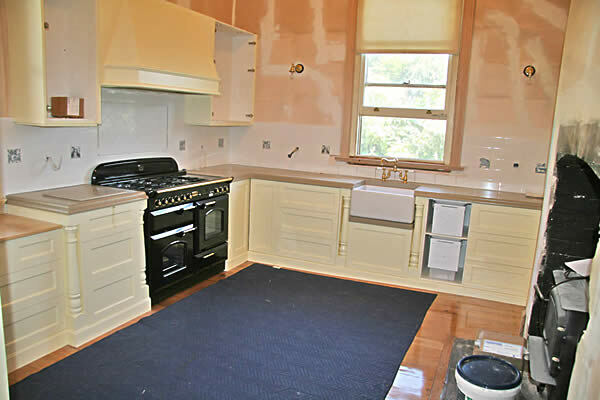 Gas hob, electric ovens and grill. Perfect combination. 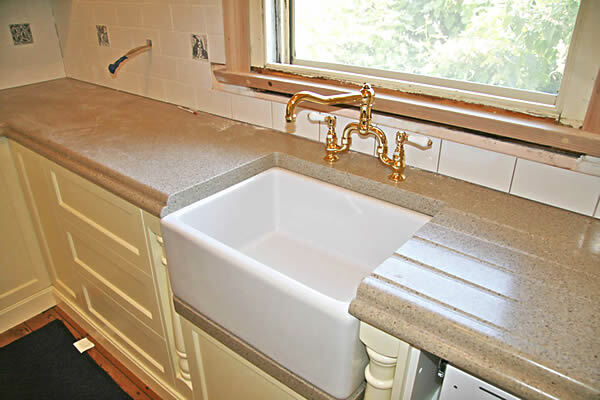 The porcelain Belfast sink all the way from Lancashire (what has happened to my locavore instincts??). It is gorgeous. So much space and the taps actually work. The sink has a spazio unit under it which removes all the plumbing from the under-sink space – so I have a huge usable drawer underneath. Brilliant. 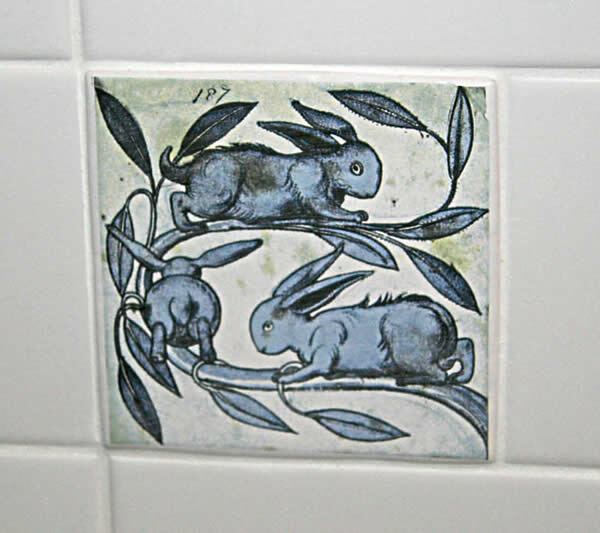 Many years ago I bought some gorgeous reproduction William Morris tiles from the Victoria and Albert Museum in London. I have been hoarding them ever since. Now they have become the feature tiles in the back splash. Finally, they are being used. Here is one featuring rabbits – they all feature animals or birds of some kind. And, finally, this morning I cooked my first meal in 5 weeks! Poached eggs! They were absolutely wonderful. Finally the saga is drawing to a close. Previous post Kitchen Renovation end of week three. Everything looks great! A lot of food to eat too. Beautiful and gorgeous, makes me want to start cooking a vege feast! There aren’t words! Sara what a stunning kitchen, and that stove! Ooh! The tiles! The produce from the garden looks incredible too – Congratulations! I am in awe, what a delightful kitchen Sara. The stove is gorgeous and the tiles are oh so perfect for your kitchen! Love the color. Also, your tile person has done a perfect job to tell by the closeup pic. It must feel very special now that the main work has been done in the kitchen and you can actually start getting a feel of what it will be like when all the work is finished and everything is working. Your harvest looks gorgeous, esp those onions. Renovations are not an easy task and you really need to pat yourself on the back for all the work well done. The kitchen is looking brilliant Sara & the stove – yes if it were mine – I nearly managed to divert if from the Melbourne wharf :), I would kiss it daily too. The harvest looks wonderful – all those potatoes – that’s a lot of chips. *grins*. long time lurking again – but Oh My!!!!!! looks like a great place to cook! Finally I finished Chemo last week. 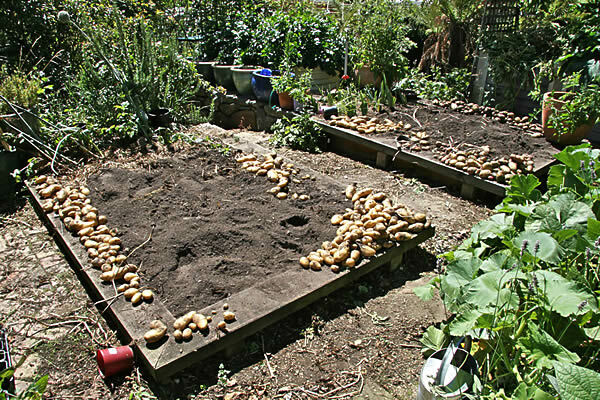 Still inspired to make a proper veggie garden to feed my family.Two spindly tomatos are not enough.While I am resting up I am planning.Your potato crop is impressive as is that cooker!How do you plan to store them long term? Potatoes are a problem to store long term … and yet not. What I will do is mash a great quantity and freeze (mash with butter and cheese if you want, but do not add milk for freezing spuds), other wise they will keep for several months in good storage (I noticed that over summer a couple of spuds I left on my potting bench in the warm shade are still in fabulous condition, so I may try somewhere a little warmer to store them than usual). I may try dehydrating some again, too, although that is never a real success for me. Otherwise I always seem to have volunteer potatoes in the garden where I can go rummaging in the depths of winter! The compost bins always seem to have a spare crop growing in them. Looks great Sara – when can the cats come home? I wonder what they will think about it all. I love those tiles. Who said hoarded stuff would never get used? Your kitchen is looking fabulous and it is so great when renovations are finally finished – hope it happens soon for you. We are replacing an 17 year old rusty oven with a self-cleaning one and a gas cooktop with an induction one. Hubby’s want – and if it means he cooks more I don’t mind at all. Not that food tastes all that good at the moment – but I’m nearly half way through the chemo. Our vegie garden is not a patch on yours (small suburban backyard) but I love being able to pick herbs for cooking. I am about to gather enough fruit to make a couple of jars of preserved lemons. Looking good. Sometime, may I request a dehydrator post from you? Please. Especially Zucchini. I was unaware they could be kept at all, except as pickle. Sure. 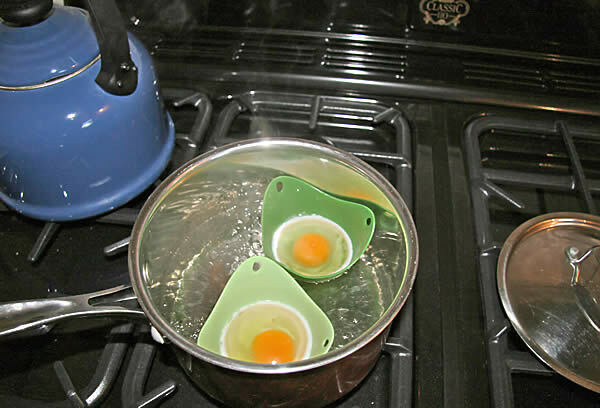 You can dehydrate virtually any food, even eggs – I prefer it to pickling as it preserves all the nutritional content of the food rather than destroying it through heat and infusing it with sugar and vinegars etc (you should always dehydrate at 42 C or less to preserve as much nutritional content as you can). Joy, I knew it was you holding up the Falcon at the Melbourne wharves where it sat for weeks before someone thought to tell me it was there!!! Congrats Sara! Hope you can get back to a bit of normality now! Wow.. It looks amazing.. Are those granite Benchtops? I am completely jealous over the amount of storage you have, and your Falcon Stove! Staron; I’ll have to remember that one. It looks fantastic.